Nancy J. Vivrette, John E. Bleck & Wayne R. Ferren Jr. Herbs, shrubs, or subshrubs, annual or perennial, often succulent, papillate, glabrous, hairy, or scaly. Roots usually fibrous, sometimes tuberous. Stems underground, or prostrate and mat-forming to erect. Leaves cauline or basal, alternate or opposite, sessile or petiolate; stipules usually absent, or free from or adnate to petiole; blade flat, terete, or triquetrous (3-angled), occasionally scalelike. Inflorescences axillary or terminal, flowers solitary or in cymes; bracts present or absent; bracteoles usually absent (present in Trianthema, Cypselea); pedicel present or absent. Flowers bisexual (sometimes unisexual in Tetragonia), inconspicuous to showy, tubular or campanulate; hypanthium present; calyx lobes (3-)4-5(-8), sometimes colored and petaloid, occasionally hooded and/or appendaged, equal or unequal; nectary absent, a ring, or separate glands; petals (including petaloid staminodia) 0-250[-300], distinct or connate proximally, often 2-4-seriate, linear; stamens 1-500(-700), distinct or connate in groups; pistil 1, 1-25-carpellate; ovary superior, inferior, or half-inferior, 1-25-loculed; placentation usually parietal, infrequently axile, apical, free-central, or basal; styles absent or 1-25, distinct or partly connate; stigmas 2-25. Fruits usually capsules, dehiscence loculicidal or septicidal, usually with multiple valves, with or without membranes covering seeds, or dehiscence circumscissile, or indehiscent berries, or nutlike. Seeds 1-500(-1000), often arillate, usually papillose; embryo coiled around perisperm. Genera 130, species ca. 2500 (12 genera, 18 species in the flora): North America (especially California), West Indies, Central America, South America, Europe, Asia, Africa, Australia; some species cultivated and introduced in temperate and tropical regions worldwide. Some California floras (e.g., P. A. Munz 1959, 1974) list Disphyma crassifolium (Linnaeus) L. Bolus as escaped from cultivation. That species is not well-enough established in the field to be considered naturalized. Many herbarium specimens labeled D. crassifolium are Malephora crocea (Jacquin) Schwantes (W. R. Ferren Jr. et al. 1981). Disphyma crassifolium has clavate leaves, long, terete peduncles, densely plumose stigmas, convex, minutely crenate ovary glands, five locules, and ovate, more or less smooth seeds. Lampranthus coccineus (Haworth) N. E. Brown also has been considered (e.g., P. A. Munz 1974) naturalized along the coast in California. V. Rattan (1896) made brief mention of the species. We were unable to locate any naturalized L. coccineus and believe that no continuing populations exist. R. M. Beauchamp (1986) cited populations on banks and dumps; he has stated subsequently (pers. comm.) that those populations no longer exist. 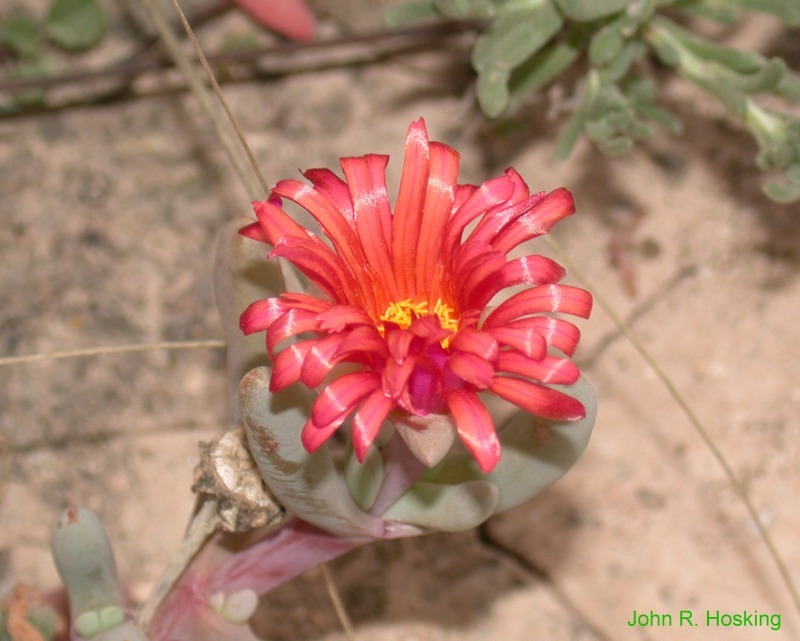 Lampranthus coccineus has connate ovary glands, five locules, and pear-shaped, more or less black, rough seeds. Aizoaceae have been considered by some authors (e.g., F. A. Pax and K. Hoffmann 1960) to include the Molluginaceae. J. K. Small (1933) included the Molluginaceae and genera of the Aizoaceae (e.g., Cypselea, Galenia, Sesuvium, and Tetragonia) in Tetragoniaceae. In contrast, Mesembryanthemum in the broad sense has occasionally been treated as a separate family Mesembryanthemaceae (e.g., H. Herre 1971; H. Herre and O. H. Volk 1948). In our treatment, Mesembryanthemum and Tetragonia (Tetragoniaceae, e.g., J. C. Willis 1973) are included within the Aizoaceae (e.g., R. S. Adamson and L. Bolus 1950; H. Melchior 1964, vol. 2, pp. 87-90) and the Molluginaceae (including Glinus Linnaeus and Mollugo Linnaeus) is excluded (e.g., A. Cronquist 1981). Mesembryanthemum has been divided into segregate genera based largely on placentation and fruit structure. "The mesembs have characteristic fruit capsules with locules (chambers or cavities) containing the seed. With few exceptions they open and close repeatedly in response to moisture (hygrochastic). The capsules are closed when dry and open when wet, limiting the dispersal of seeds to wet conditions. This repetitious dehiscence mechanism, whereby the valves that form the lid of the capsule are opened and fold back, relies on the response of expanding keels to moisture. Seeds are liberated from the open capsules. This unique dispersal mechanism is particularly suited to dissemination and germination in habitats where rainfall is erratic" (G. F. Smith et al. 1998). For excellent illustrations of these complex fruit types, see Smith et al., pp. 22-23. Some genera of Aizoaceae have wide-ranging species (e.g., members of Trianthema and Sesuvium), which are thought to be bird- and water-dispersed and are associated with moist habitats. Other members of the family are more restricted in distribution. Those include many of the succulent species, which are dispersed locally by water drops splashing seeds out of the fruit (Mesembryanthemum crystallinum), by vegetative propagation (both by accident and for landscape purposes, i.e., Delosperma, and by flotation of various plant parts). Malephora crocea (W. R. Ferren Jr. et al. 1981) and Carpobrotus edulis are from South Africa and have been introduced in the flora and elsewhere through horticulture. The distributions of other species such as Mesembryanthemum crystallinum and M. nodiflorum of southern African origin are more difficult to explain. Their nineteenth-century distribution in the United States on ballast on the Atlantic coast and around bays and coastal headlands on the Pacific coast suggests a human vector. Collection by the earliest botanists suggests a long period of establishment. Considerable discussion and disagreement exist concerning the native status and mode of dispersal of a number of the coastal succulent members of the family (S. H. Bicknell and E. M. Mackey 1998). Perhaps the most controversial example has been Carpobrotus chilensis; opinions have ranged from introduced weed to rare and potentially endangered endemic. Adamson, R. S. and H. M. L. Bolus. 1950. Aizoaceae. In: R. S. Adamson and T. M. Salter. 1950. Flora of the Cape Peninsula. Cape Town. Pp. 363-365. Boetsch, J. R. 2002. The Aizoaceae and Molluginaceae of the southeastern United States. Castanea 67: 42-53. Brown, N. E., A. Tischer, and M. C. Karsten. 1931. Mesembryanthema. Ashford. Herre, H. 1971. The Genera of the Mesembryanthemaceae. Cape Town. Jacobsen, H. 1976. A Handbook of Succulent Plants.... 3 vols. Poole. Vol. 3. Jacobsen, H. 1977. Lexicon of Succulent Plants..., ed. 2. Poole. Pp. 395-583. Pax, F. A. and K. Hoffmann. 1934. Aizoaceae. In: H. G. A. Engler et al., eds. 1924+. Die natürlichen Pflanzenfamilien..., ed. 2. 26+ vols. Leipzig and Berlin. Vol. 16c, pp. 179-233, 587. Schwantes, G. 1957. Flowering Stones and Mid-day Flowers. London. Smith, G. F. et al. 1998. Mesembs of the World. Pretoria.